And yet… rapport can dry up, chat can oppress, and experience can teach us to hide. What we bring to the world of work and living together can be facing the same way as our intentions but sometimes we face west when we intend to move east. And the best of intentions can be in collision with the unforgiving intransigence of time, capital and other people. Other people. People also with intentions and beliefs, and likes and dislikes. When we sit in a room with a group of other people seeking to sharpen the focus on a task, perhaps a commoning task, what helps and what hinders agreement? Or if it is more relevant, creative destruction? There is no single or simple answer. Complexity unfolds in both familiar and unexpected ways, can we shake out a few ingredients that go into the group mix? This is what the two images below propose. They present two takes on a psychosocial field. After we meet and greet, when an event begins, whether it is commoning or a papal enclave or a G7 summit, as we come to order, an instance of the psychosocial field flows out of the ingredients we each bring with us. Each person at the meeting brings with them some version of the basic ingredients. After we turn up the heat in the groupwork and bake ourselves afresh, does the meeting have the aroma of freshly baked bread? If not, why not? 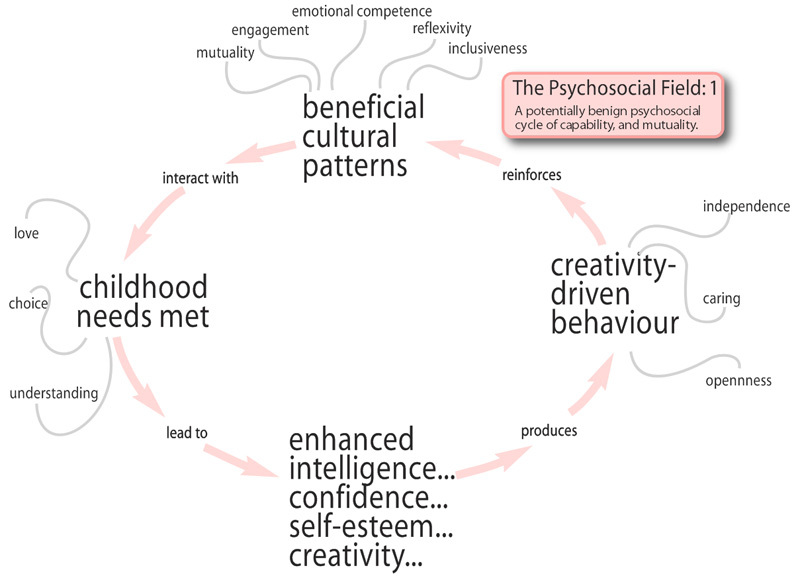 Let your intuition loose on the two versions of the psychosocial field below and see what you find. This is the first of two posts of reflections following my participation in the Economics and the Common(s) Conference – From Seed Form to Core paradigm in Berlin May 22-24, 2013 See also the second post Making Money. In this post I’ll offer some reflections on the conference experience and in the second I’ll say something about what I’ll take away from it into commoning. I had three agendas for the four days of the Berlin Commons conference; the first was to gain perspective on the psyCommons perspective, the proposal that there is an existing and thriving commons of human rapport, ordinary wisdom and shared power. Done. It was easy to see how the psyCommons notion sits within an emerging worldwide cultural/political movement focused on commons and commoning, plus rolling back or interrupting enclosures of commons of any kind. What is being sought is a way of structuring human social relations that reaches ‘beyond market and state’. My concerns about whether the psyCommons proposal had legs were dissolved by the experience of discovering at the conference a vast collection of global and local networks of commons action and intention, many of them wildly divergent but in ways that spoke of the emergence of powerful cooperative ethos. Agenda item two: make connection with key exponents of the emerging commons, over two hundred people from 30 countries attended the conference. Done. The positive zizz of the conference was overwhelming, how to keep discrimination awake was sometimes a struggle. Each morning at breakfast in the hotel the muzak played Judy Garland singing Over the Rainbow. Might the commons movement and with it the psyCommons proposal be only a tiny blip on the event horizon of capital accumulation? Might commoning be co-opted as a band aid for its woundings? An ever present danger perhaps but aren’t we also inhabitants of an inflection point in history equivalent in its scope to transform our economic life as Gutenberg’s press? And if so doesn’t the re-emergence of the commons as a way of structuring social relations provide an antidote to the supposed inevitability of capital? …albeit following the application of considerable force. And a certain optimism could be held to permeate the very ground beneath us in the conference venue. The Heinrich Böll Foundation occupies a site in the Mitte district of central Berlin that until 1989 was behind the Berlin Wall. In that year the German Democratic Republic, the GDR, a client state of the USSR that had for decades maintained a barbed wire and guard post grip on millions of German people, succumbed to determined peaceful resistance (though not without enormous pain and recrimination). Optimism about the commons as a ‘world beyond market and state’ could still be misplaced but the Berlin wall fell, an unimaginable event for those of us old enough to have seen the horror of it in operation. So too in some countries have civil rights been transformed (not to forget slavery) and there have been local successes too, the toxicity of smoking seemed immutable but sustained effort has created smoke-free offices and other buildings. And then there is the matter of scale, how can the re-emergence of commons and commoning match the scale of the interplay of market with the transport commons that we met on arrival at the Berlin central station? Here again might not threads of optimism about commoning be found? What makes such an elaborate infrastructure and huge complexity of processes feasible both in design and management? Isn’t it software and internet interoperability? And isn’t this, as was very apparent at the Commons conference, now available to anyone and everyone? So far as the psyCommons proposal suggests that human rapport is ubiquitous, don’t we now through the internet and associated software, have the means of production for communities of global and local commons? A third agenda I took with me to Berlin was the expectation of being able to contribute, to find people for whom the psyCommons proposal would seem like a gift. The richness of the presentations, perspectives and diversity of takes on what the commons might be, should be, or already was, ran wall to wall, and some of it was vividly memorable, however contribution turned out to be more problematic and I remain unclear why this was (but read on). In the infrastructures stream I gave a brief account of the Independent Practitioners Network (IPN), a long-standing commons infrastructure, but there were no followup questions, no further interest. I raised the notion of psyCommons in the culture stream but again it was received politely but without questions or followup. 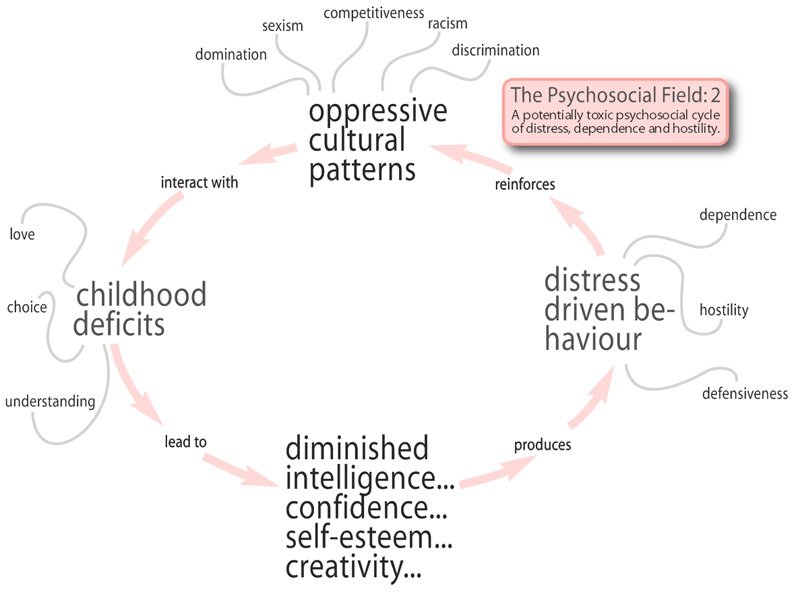 Did I run into, as I suspect, some (appropriate) aversion to psychology as a pariah domain of distress and stigma? (there’s an understanding among therapists that at a party never say you are a psychotherapist – people will disappear). Awkward this and it could be mindfluff. However for all its value (see post 2!) I did tend to experience some aspects the conference as leaning towards the technocratic – technocratic in the sense that there is a technical solution to any and every problem and away from the subjectivities of heart and body (though the food was great!). I had expected to meet far more lived experience of commons and commoning, instead intellectual/academic conversations ‘about’ commons often seemed to prevail – there was a strong ‘digital commons’ story – that sometimes morphed into a ‘knowledge commons’ narrative which seemed to presume that everything of consequence can be digitised – there was even an assertion that ‘all commons are knowledge commons’. And it needs to be acknowledged that this was framed by a repeated emphasis on the need to move from transaction to relationship. I take this as a reminder that human relationship is based on a commonality of presence, of gaze, of body language, where feeling and emotion, sustained through rapport precede and shape discrimination and action. But oops… might we be back to the pariah domain of psychology? After 27 years as a psy practitioner and something like ten years as an activist in the task of confronting the micro-fascism of therapy professionalization in the UK, my attention shifted. Too much ‘against’, too much ‘they’re terrible’, not enough ‘what do we want’, not enough ‘big picture’. And then I fell upon a big picture, or rather it fell upon me, the institutions that we had been opposing were offensive because they were fencing in, making enclosures, of a field of mutual caring, rapport and cooperation that belonged to all of us, a commons, the shared power and ordinary wisdom of the psyCommons. I realized recently that I had written several separate introductions to the psyCommons, (see pages left) it was time to broaden the enquiry and to reach an audience outside the therapy world. Welcome to the psyCommons blog. You are currently browsing entries tagged with rapport at psyCommons.